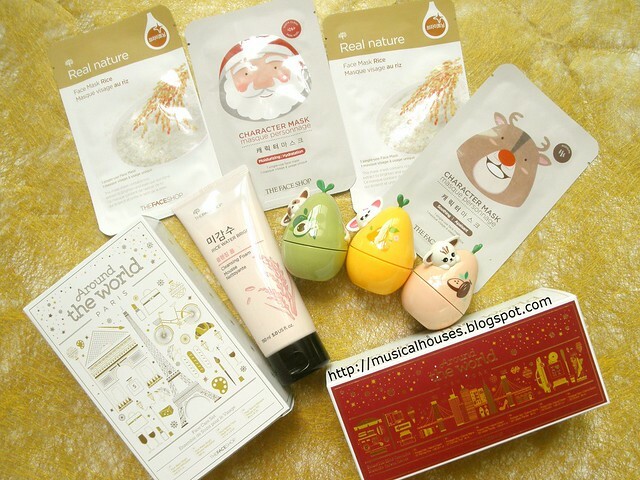 The Face Shop's Holiday 2015 Collection is called Around The World, and I've already reviewed the Rice Water Bright Cleansing Foam and Real Nature Face Mask Rice set, and I'll be reviewing the rest of their Holiday products today! While I wasn't a fan of the Rice Water Bright Cleansing Foam and Real Nature Face Mask Rice set, I have to say, the rest of their Christmas collection has been pretty great so far! 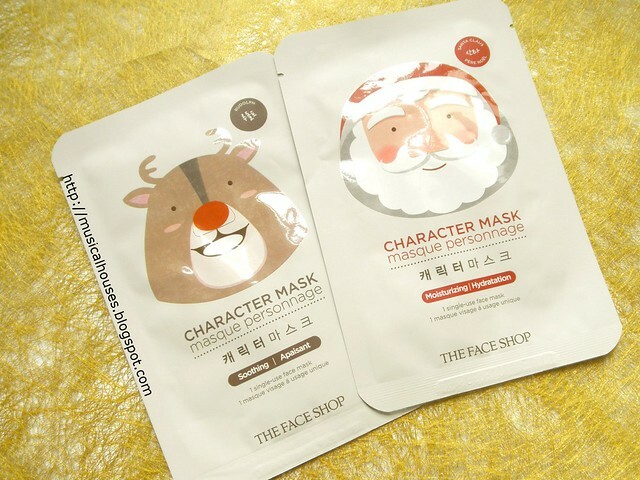 In addition to the Rice Water Cleansing Foam and Real Nature Face Mask set, there are also super-cute Character Masks with special Christmas designs, as well the Protect Me! 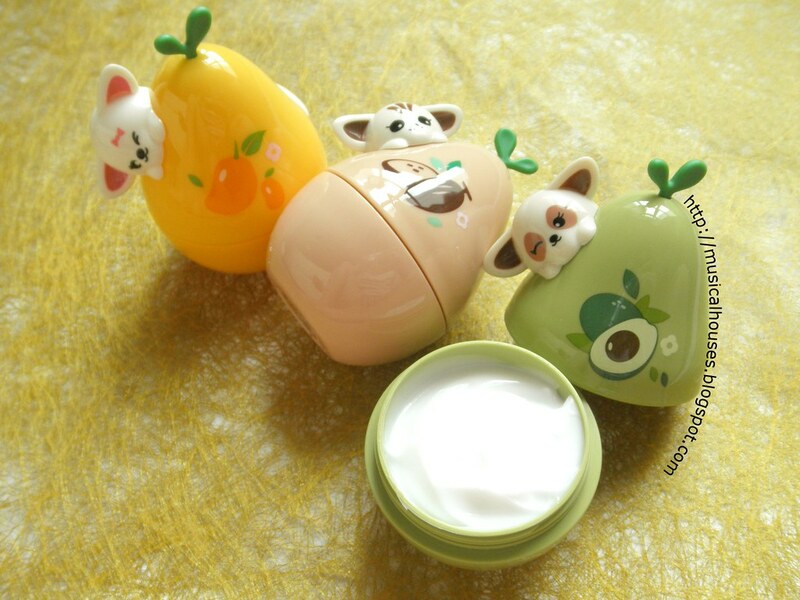 Hand Cream set, with 3 little cute adorable tubs of hand cream. So clearly the focus of these sets is on skin and bodycare. 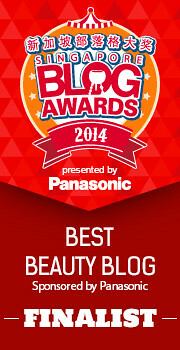 Without further ado, let's get around to reviewing all these sets! Of course, it's a given that they make cute gifts (for yourself too, not just for others), but what's in those products? We'll take a look! First, let's start with the Character Masks. The Face Shop had launched their Character Mask earlier this year, and I had reviewed the masks and thought they were pretty good. Those were generic animal designs, whereas the Christmas version has both Santa and Rudolph designs. 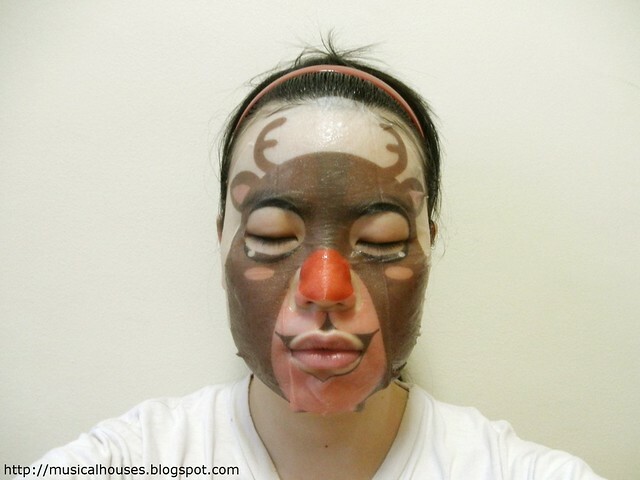 The Rudolph Character Mask is supposed to be soothing, while the Santa Character Mask is supposed to be moisturizing. 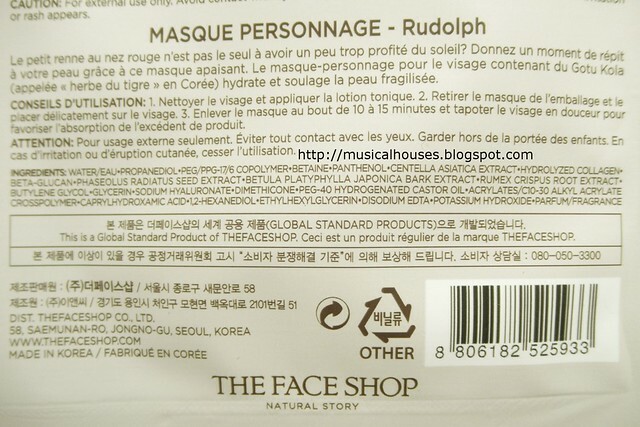 The ingredients in the Rudolph Character Mask are Water, humectants (Propanediol, Panthenol, Butylene Glycol, Glycerin, Sodium Hyaluronate) emollients (PEG/PPG-17/6 Copolymer, Dimethicone, PEG-40 Hydrogenated Castor Oil), anti-inflammatories (Beta-Glucan), and a few plant extracts (Centella Asiatica, Phaseolus Radiatus, Betula Platyphylla Japonica, Rumex Crispus Root), film formers (Acrylates/C10-30 Alkyl Acrylate Crosspolymer), preservatives (Caprylhydroxamic Acid, 1, 2-Hexanediol, Ethylhexylglycerin), chelating agents (Disodium EDTA), and pH adjusters (Sodium Hydroxide). 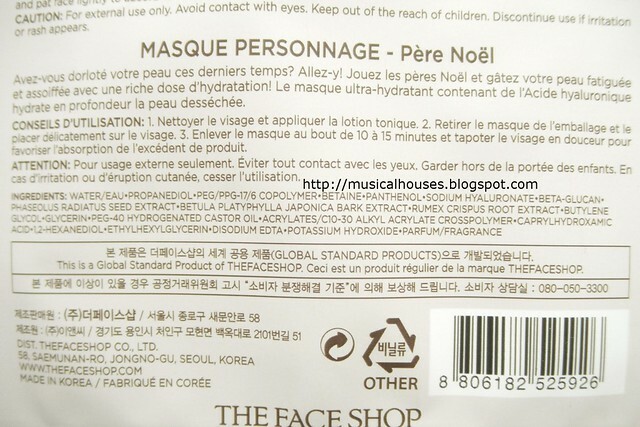 Looking at the ingredients list, it's quite similar to the original Character Mask ingredients - it's got the same key humectants, emollients, plant extracts, preservatives, and everything. So in that sense, it's no surprise that I liked this mask, because I did like the original Character Masks too. The only difference is the order of the ingredients. This could be due to either the ingredients being used in different concentrations, or due to differences in the way the ingredients are listed (the US and Korea have different rules for ingredients listing, and I'm not certain which version I'm getting each time round). Regardless, this is a sheet mask with humectant properties, and seems to have Panthenol in fairly high amounts, which is always a plus for me. The Santa Character Mask also bears some similarities to the Rudolph Mask and the original Character Masks. There are the same humectants, emollients, preservatives, and other ingredients, so again, it's no surprise that the basic functions and properties of the Mask is the same - it's a lightweight sheet mask with humectant properties, and a variety of plant extracts. The main difference between the Santa Character Mask and the Rudolph one is, again, the order of the ingredients. The Santa Mask seems to have higher concentrations of some of the minor humectants (Sodium Hyaluronate being the main one), while the Rudolph Mask seems to have moved up some of the other plant extracts and Beta-Glucan instead. I suppose this is in line with the masks' purpose - a moisturizing mask would have a higher concentration of humectants, while a mask that is meant to be soothing should have a higher percentage of anti-inflammatory ingredients. What this means is that while you might prefer one or the other, formulation-wise, both masks are pretty similar, with identical key ingredients, and only some minor changes in the ingredients order. So, don't worry if you wanted the Santa Moisturizing Character Mask but could only get your hands on the Rudolph Soothing one and vice versa. 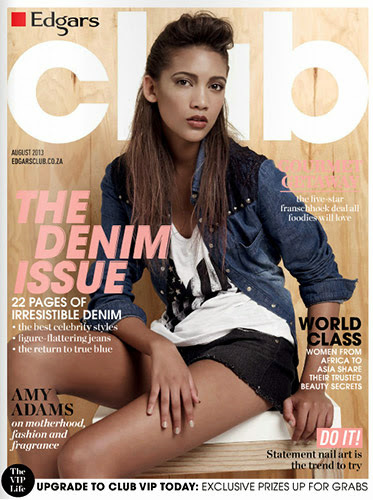 Chances are, you'll like the other one too, if not just as well! And above, a little demonstration with the Rudolph Character Mask. Unfortunately I didn't look like a cute reindeer when I tried it, but ultimately, it's about how the mask works, right? When I tried this mask, I found that it had a nice floral scent, and that my skin seemed more moisturized and generally better-looking after use. Some of you may recall that when I used the original Character Mask the first time I had some slight redness that went way quickly but was otherwise difficult to explain, since nothing in the ingredients list looked particularly irritating, and I thought it could just be that my skin was just being extra sensitive during that time as I was on isotretinoin for my acne. Well, this time around, now that I'm no longer on isotretinoin, I didn't have any such adverse reactions at all, although the ingredients in the sheet mask were very similar. So I do think it was just my skin being a bit more sensitive back then. We also have the Around The World Protect Me! 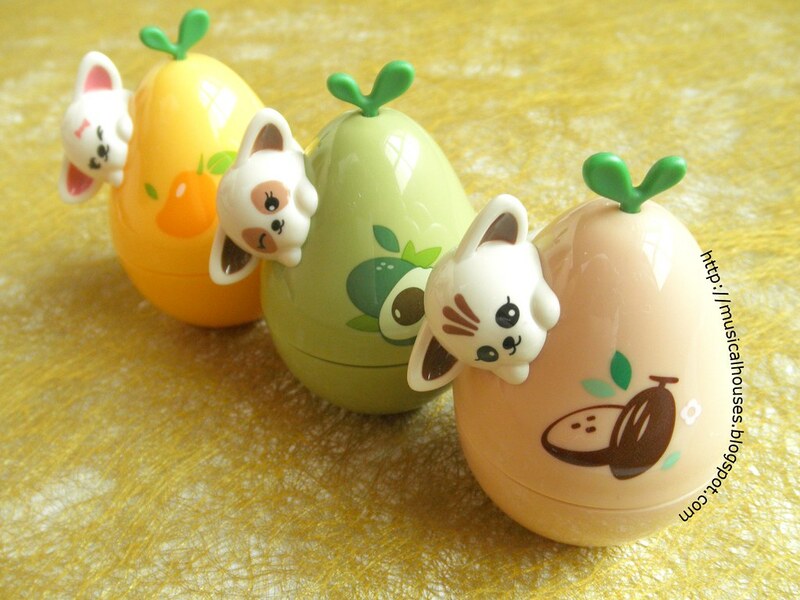 Hand Care Set, and this is so adorably cute! I'm not too sure why the set is called "Protect Me! ", but the 3 little animals on the tubs are all depictions of endangered animals (fennec fox, lesser panda, and ocelot), so there may be a connection there. Cute packaging aside, the Protect Me! Hand Creams also look like they have a pretty nice ingredients list to boot! The ingredients list are basically identical across the 3 types, so we can analyze them all at one shot. There's water, and a bunch of emollients (Cetearyl Ethylhexanoate, Cetyl Alcohol, Butyrospermum Parkii Butter, Macadamia Ternifolia Seed Oil, Isopropyl Myristate, Caprylic/Capric Triglycerides, Theobroma Cocoa (Cocoa) Seed Butter, Arachidyl Alcohol, Behenyl Alcohol, Stearic Acid), which include some that do double duty (e.g. 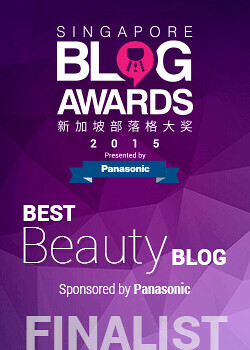 as emulsifiers), and also some from plant-derived butters and oils. 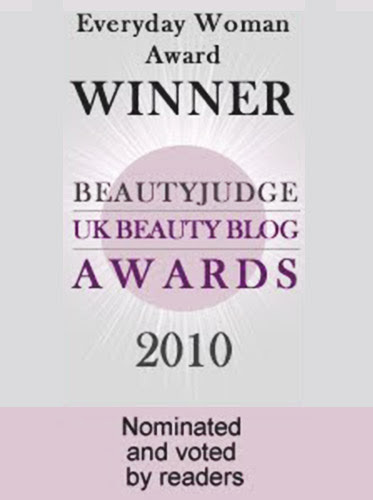 There are also humectants (Glycerin, Propanediol, Urea), which are great in a hand cream too. The rest of the formula consists of various functional ingredients, like thickeners (Zea Mays Starch, Ammonium Acryloyldimethyltaurate/VP Copolymer), emulsifiers and stabilizers (PEG-100 Stearate, Glyceryl Stearate, Arachidyl Glucoside, Sodium Acrylate/Sodium Acryloyldimethyl Taurate Copolymer, Isohexadecane, Polysorbate 80), preservatives (1, 2-Hexanediol, Phenoxyethanol) and the like. 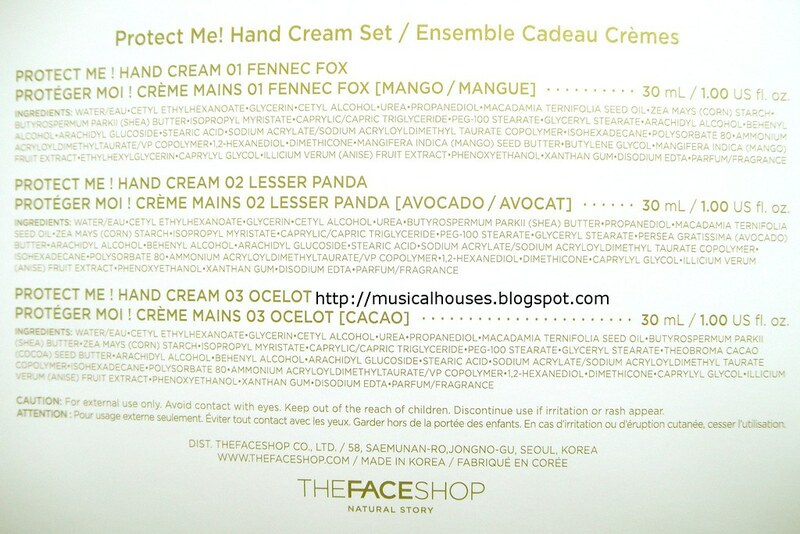 The Face Shop Around The World Protect Me! Hand Care Set: Hand Cream in adorable packaging! So, looking at the formula on the hand creams, these are formulated to be moisturizing, with plenty of emollients and humectants to help dry skin out. For those who like the inclusion of plant-derived ingredients, there are some quite popular ones here too, such as shea butter, macadamia oil, and cocoa seed butter. While I personally am not a very big fan of Isopropyl Myristate in my face products because I think my skin is sensitive to it, I don't mind it at all in my bath and body products, because the rest of my body isn't as prone to breakouts as my face is (go figure). 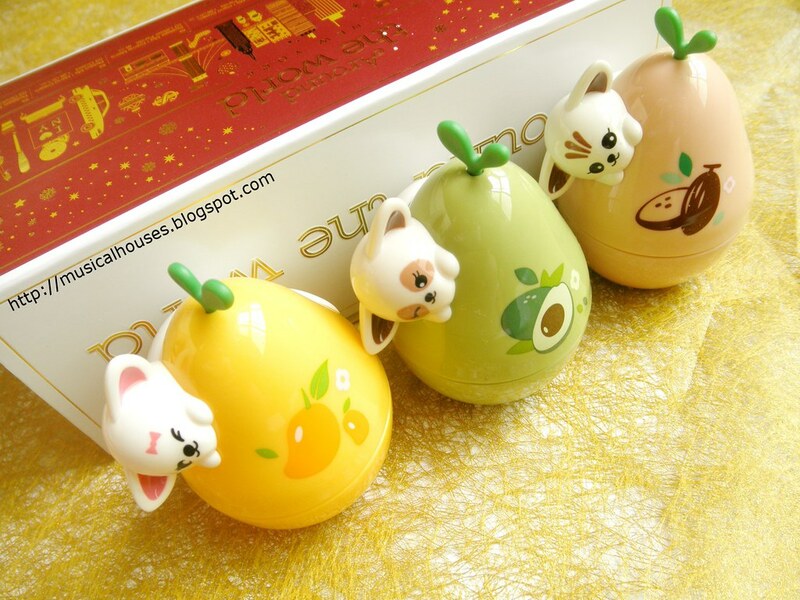 So I'm quite happy to use these hand creams, and to showing off how cute they look on my desk, too! When I used these hand creams, I found that they were initially quite thick upon application, but they do sink into skin fairly quickly, so I didn't have any issues with excessively oily hands or anything like that (at least, not more than usual). There is also a nice floral-fruity scent to the cream. Using it, I did think it helped in preventing my hands from getting drier. The packaging will also sit very well on a vanity table or work desk, and also quite travel-friendly if the screw tops of the creams don't come loose. Would I recommend the Around The World Character Sheet Masks and Protect Me! Hand Care Set? In both cases, I would. I think both products are quite well-formulated, and beyond their cute seasonal packaging, also do what they claim to do, which is moisturize and sooth the skin, as well as keep your hands moisturized. I always appreciate products that manage to meld together form, function and a dash of fun, and that's what these do! The Around The World Character Masks are $4.90 each, and the Protect Me! Hand Care Set is $24.90, so they're pretty budget-friendly too. I think the Hand Care Set in particular is going to be pretty gift-able - I mean, who wouldn't like the packaging? The Bottom Line: The Face Shop's Character Sheet Masks are formulated to moisturize skin and have anti-inflammatory ingredients, while the Protect Me! Hand Care Set has an emollient hand cream in very cute packaging. Oh my! This is soooo cute. Love the cutie packaging and qualities are impressive. I think this is a great gift idea.